Raijintek is well known for their coolers and their innovative cases and they strive to try and bring the cool the market without the huge cost. Today, we take a look at the Vega variant of their famous and well-known GPU cooler, the Raijintek Morpheus II Vega Edition. 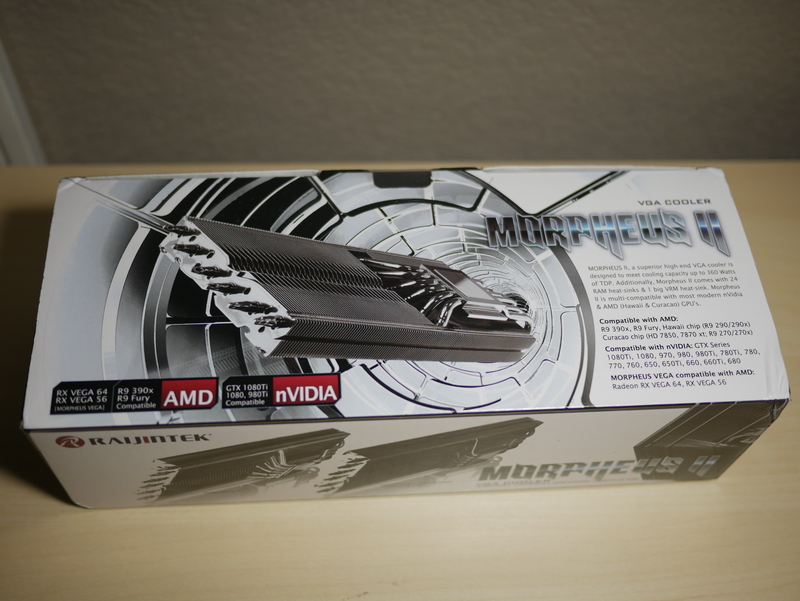 Starting out with the outside of the box, in the front you have a nice picture of the Morpheus II and in the bottom left and right corners the different GPUs it’s compatible with. 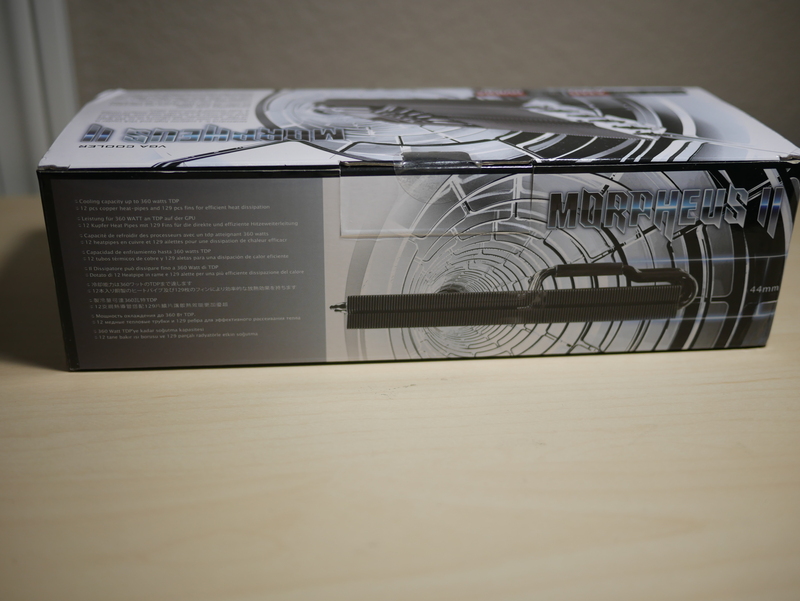 The back of the box has another pic of the cooler along with a few features. On one side of the box you have a list of specifications for the cooler. 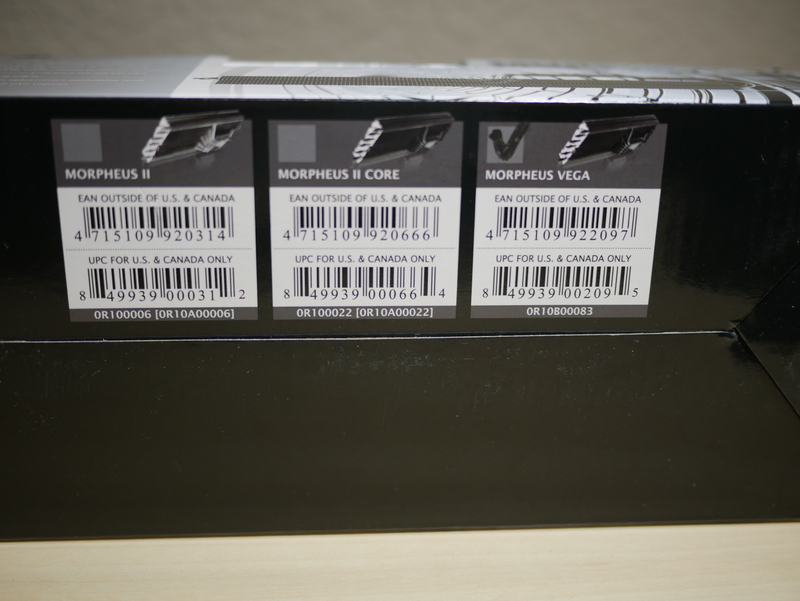 On the bottom of the box you have the different variants: Morpheus II, Morpheus II Core and Morpheus Vega. 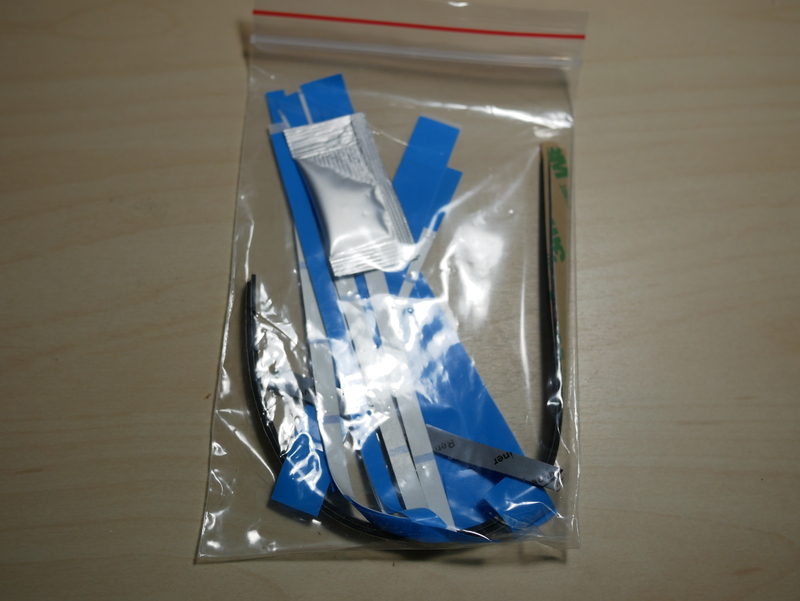 Opening the box, you are greeted with the sight of the instruction manual and a bag with insolation strips, thermal pads, screws, a backplate and aluminum heatsinks. 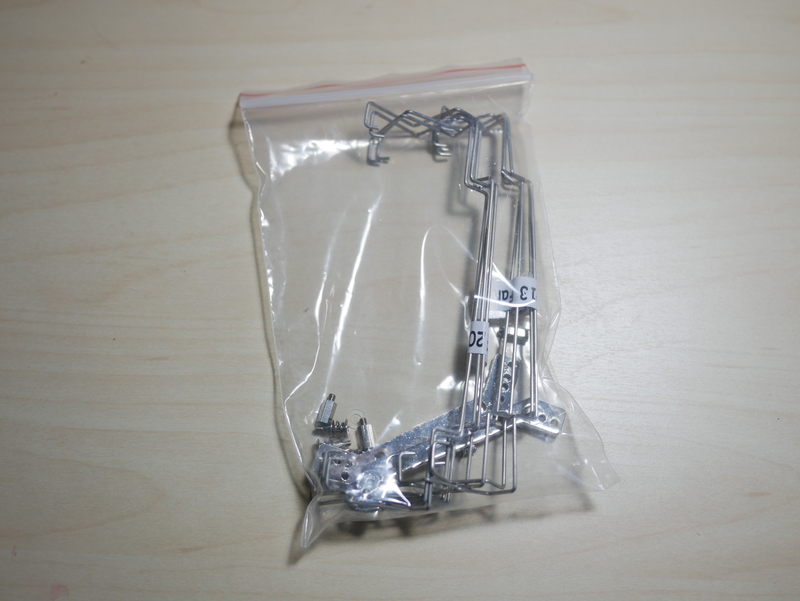 Underneath those bags is a bag with the mounting hardware and also fan clips for both 120mm x 15mm and 120mm x 25mm fans. Removing all the hardware and accessories bags, you have the cooler itself. The cooler isn’t surrounded by foam, but the heatsink also isn’t that heavy so it shouldn’t receive any damage provided the box its housed in doesn’t receive any damage. Taking a closer look at the cooler, you notice the large fin stack of 129 fins. 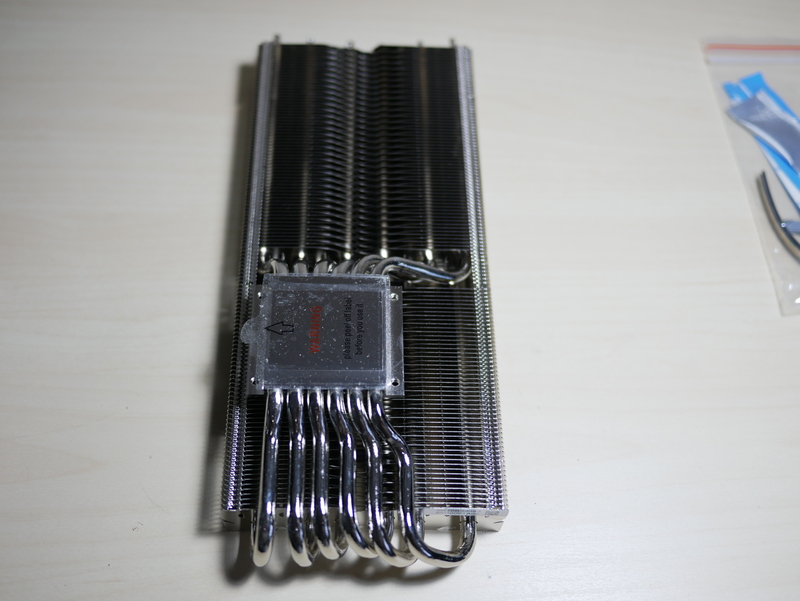 There are 12 heatpipes that enter the cold plate even though it at first looks like only 6. 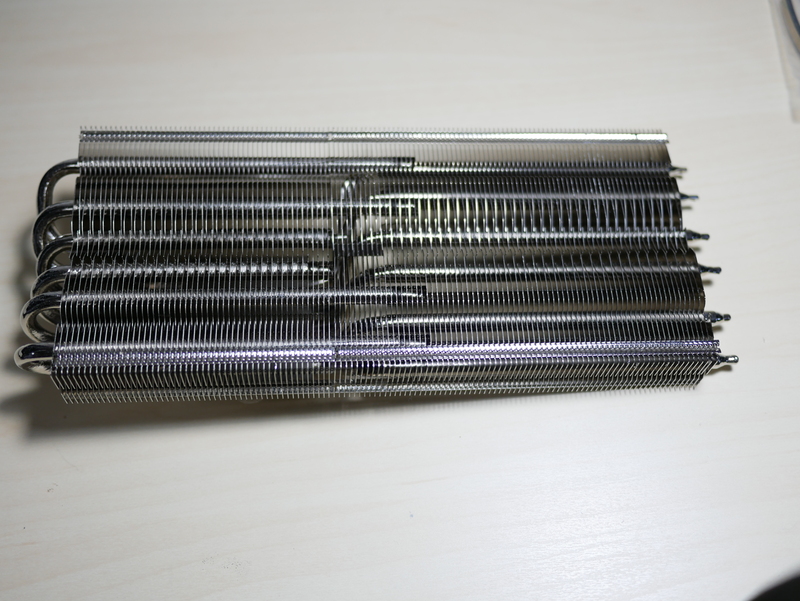 The cold plate is nickel-plated copper and the fins are nickel plated aluminum. You might wonder how this Vega edition differs from the Morpheus II design? The heatpipes have been raised a bit higher compared to the Morpheus II and the heasink base has been modified to account for the two hot spots created by the HBM modules on the Vega die. 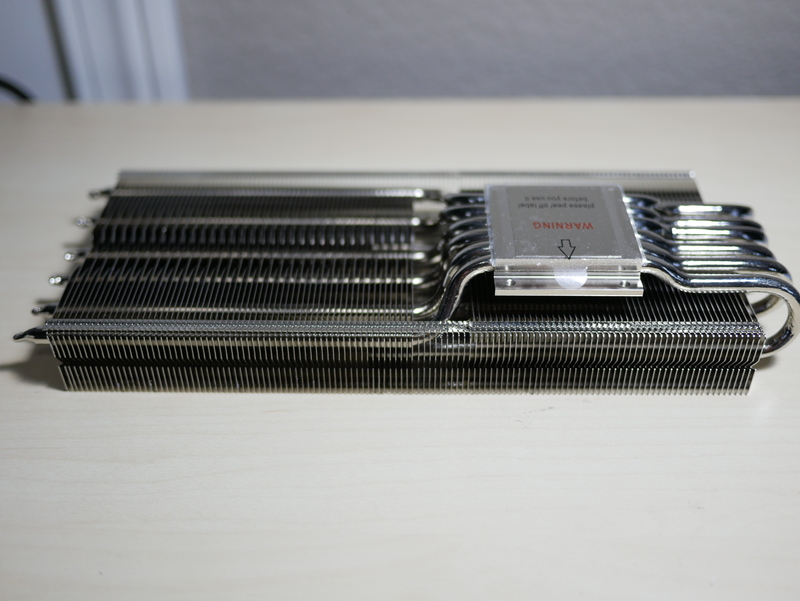 Overall, the entire heatsink is large and has the look of a Navy aircraft carrier. The cold plate is offset from center and also elevated to not create any interference with any heatsinks, VRM or SMDs below. The height of the cooler is 44mm, which might not seem like much, but when you add a standard 120mm x 25mm fan that’s 59mm. This height increase can turn a 2-slot GPU into about a 4-slot GPU, so keep it mind it may be difficult to Crossfire two AMD GPUs with the Morpheus II coolers. 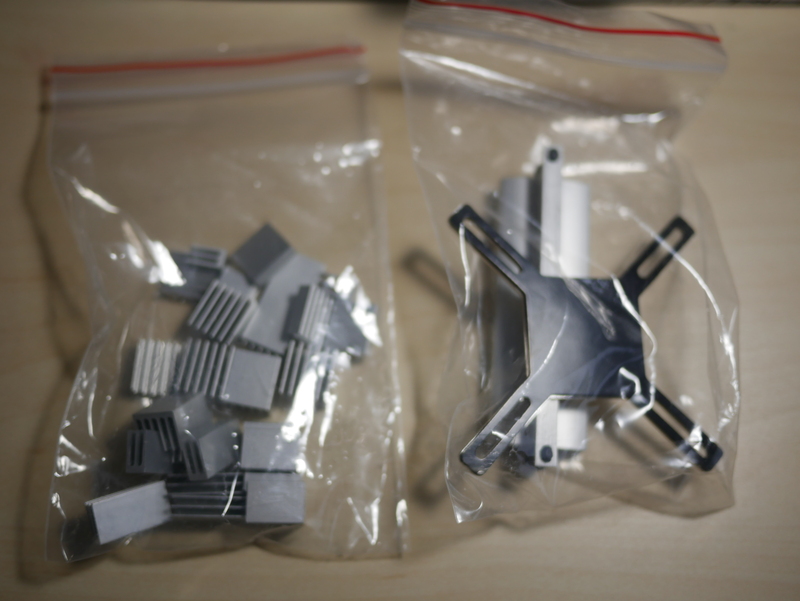 Included in the accessories bags is more than enough aluminum heatsinks for VRM and memory and also thermal pads. 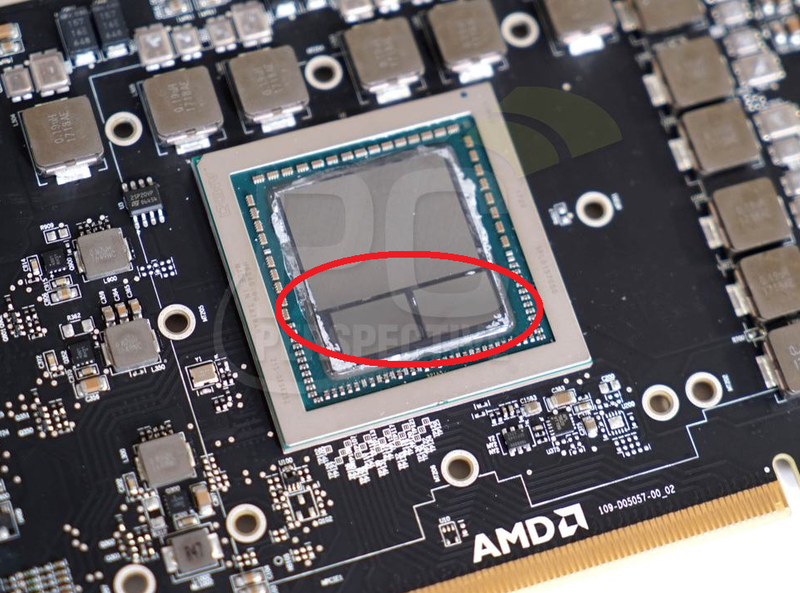 There is a bracket included with several mounting locations to be able to accommodate the GPUs listed above. 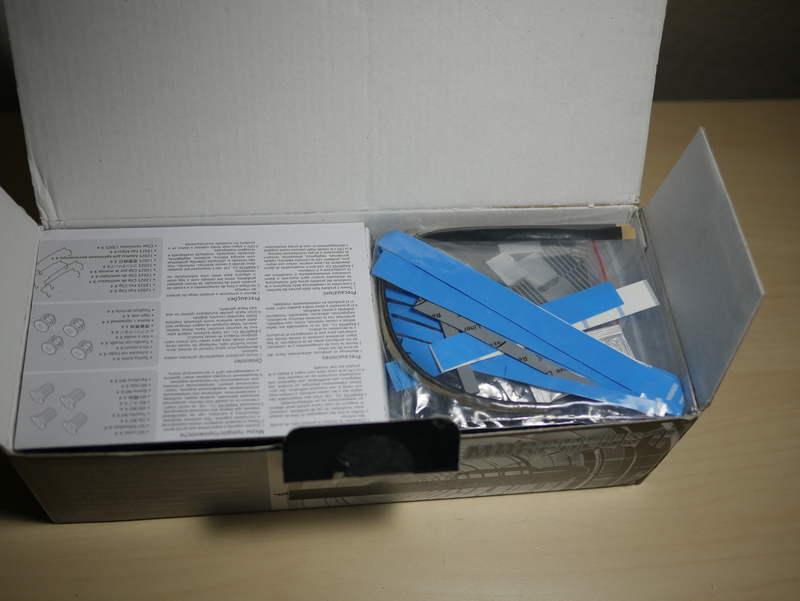 The instructions provided in the box are the standard Morpheus II instructions and are not updated with the Vega verbiage. Follow the mounting location for the Fury (same size socket) to place your standoffs in the bracket for Vega 56 & 64. Ashes of the Singularity GPU Test: The GPU test is a great test for stability and temperatures because it puts a full load on the GPU during the test. Installation was pretty straight forward following the directions. 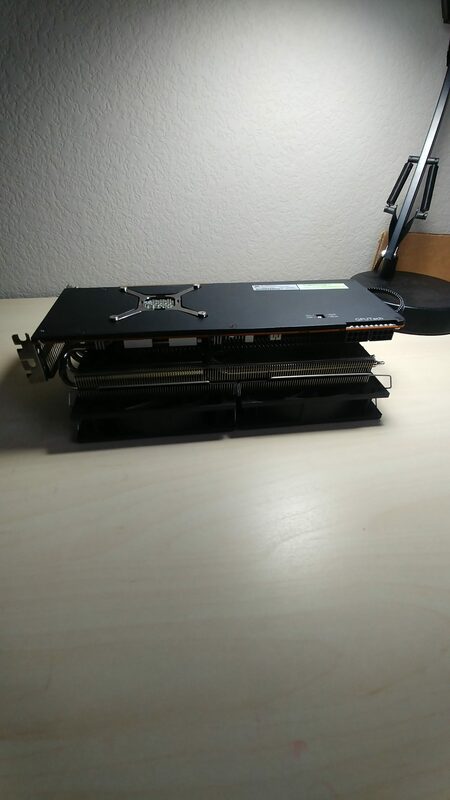 The key is to follow the directions for the Fury cards as the instructions have not been updated to designate Vega cards, but the Vega cards have the same hole spacing as the fury cards. First, I removed the stock blower cooler, to included all of the thermal pads also. Next, I installed thermal pads and aluminum heat sinks to the VRM components around the card. Then I installed the bracket on to the cooler and placed the standoffs in the fury card spacing holes. 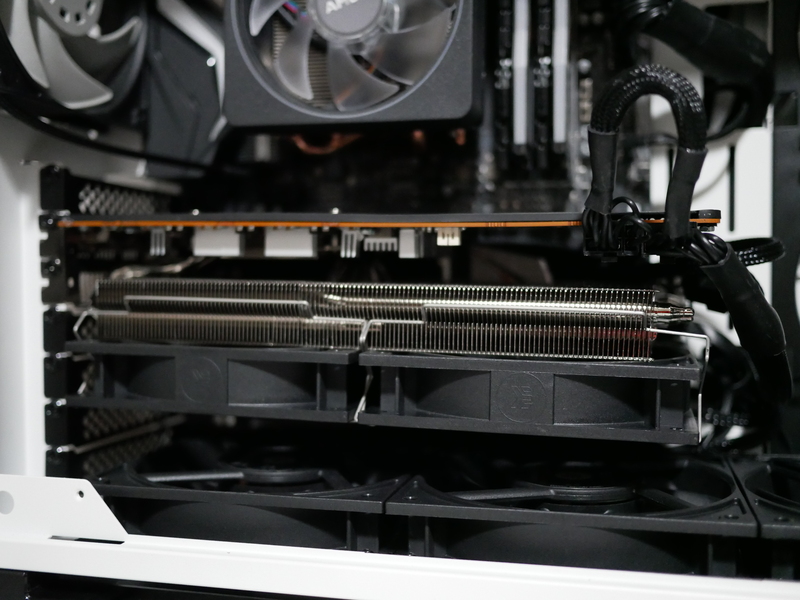 I then opted to use the provided screws and springs for the Morpheus with the stock AMD brace to not only put the same pressure around the GPU socket, but also to be able to use the stock backplate. After installing the Morpheus with Noctua NT-H1 thermal paste and securing it down with the screws and AMD brace, I installed the AMD backplate with the stock backplate screws, M 2.5 nuts and some small plastic washers. Using the AMD brace and backplate are not necessary, I opted to accomplish the extra steps for aesthetics. 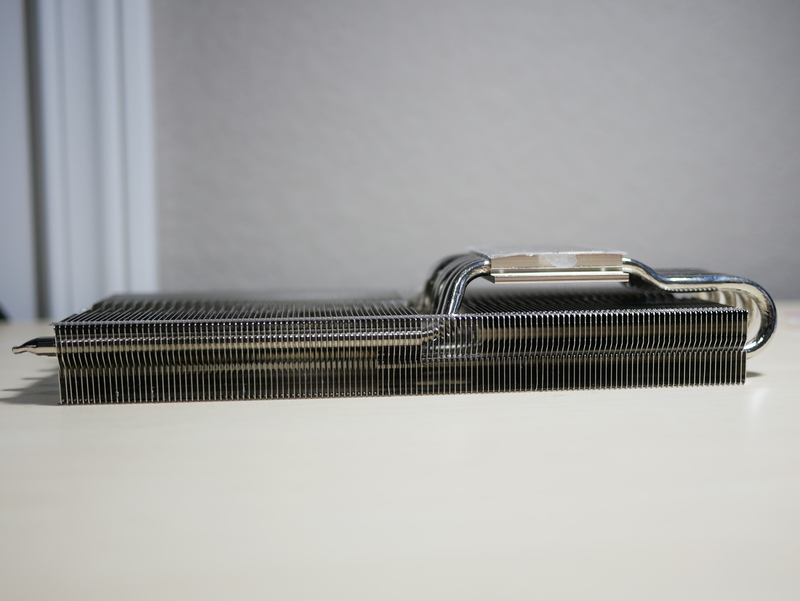 The supplied Raijintek backplate is sufficient to secure the cooler to the PCB. 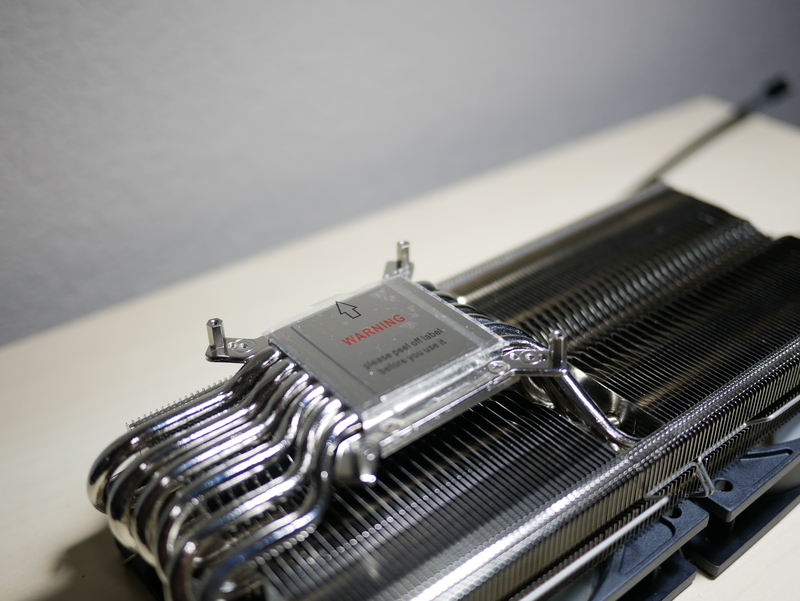 Finally, it is time to install your 2 x 120mm fans to the Morpheus cooler with the provided securing clips. I installed 2 x 120mm EK Vardar fans as I opted for pressure optimized fans (due to them being secured against a heatsink) rather than an air flow optimized fan. 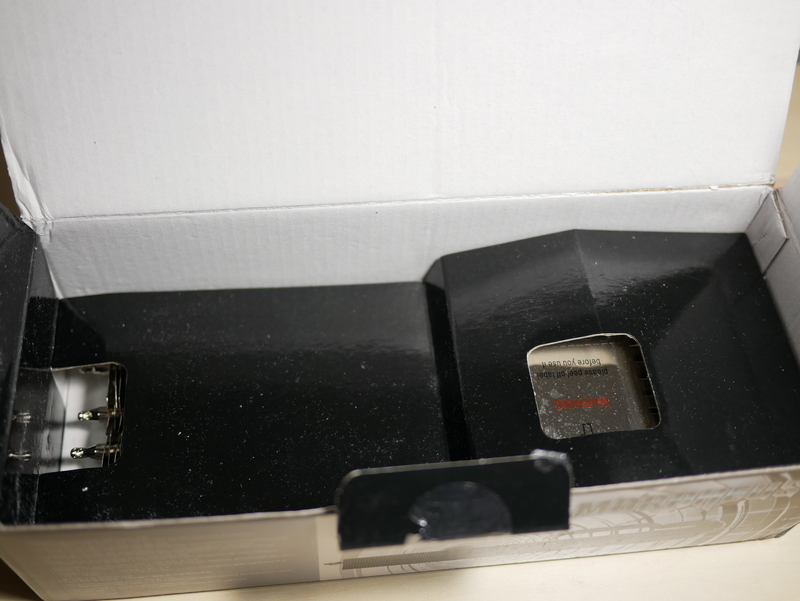 Lastly, I purchased an installed a 4 pin to VGA adapter to be able to connect my 2 x 120mm fans to the VGA fan plug. 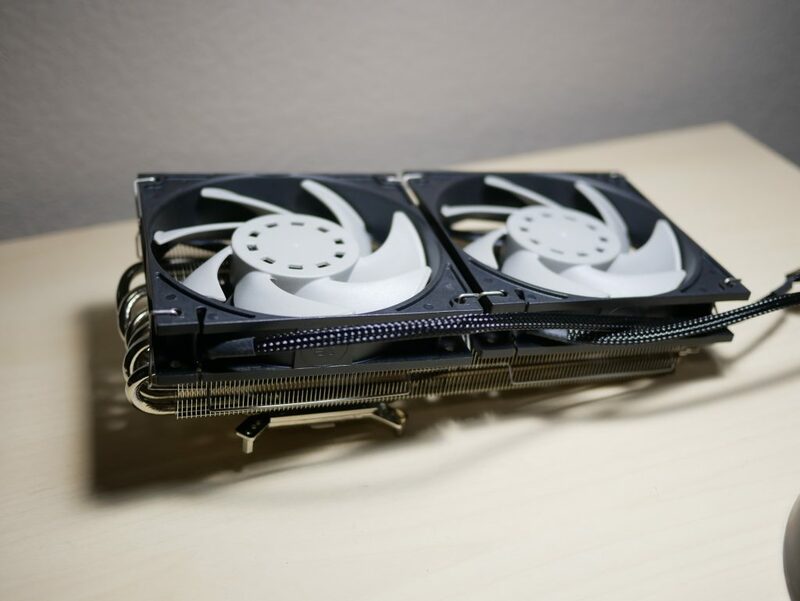 This is not a necessary step and the fans can be connected and controlled by your motherboard. The following are what I believe to be a few real-world representative tests to be able to stress Vega GPU and the cooler installed. The tests were also run with a stock Vega 64 cooler and the fan profile set to 2400-3400 rpms. The 120mm fans provide ample cooling for any components on the PCB that did not have an aluminum heatsink placed on it. The ambient temperature of the room during testing is 20 C. The testing was conducted with the 2700X stock settings. During testing the hottest temperature is recorded. While playing Mass Effect Andromeda for 2 hours my hottest temp with the stock Vega 64 was 85 deg C and with the Morpheus Vega it was 61 deg C.
For testing the stock Vega 64 under the 1080p Crazy setting and the custom fan profile of 2400-3400 rpm I had at Max Temp of 85 deg C. With the Fan speed set to Auto with the Morpheus Vega installed, the hottest temperature after the benchmark test was 56 deg C. With the Fan speed set to 50%, the hottest temperature recorded was 53 deg C. Lastly, with the Fan speed set to 100%, the hottest temperature recorded was 49 deg C.
Bottom Line Overall, If you are interested in looking for a replacement GPU cooler for any stock GPU cooler take a look at the Raijintek Morpheus. 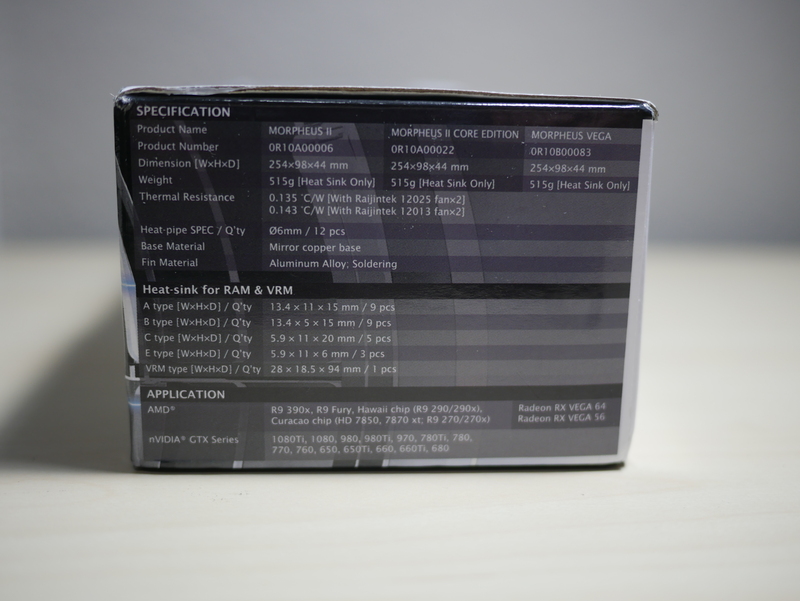 If you are looking for one for your Vega 64 & 56, pick up the Raijintek Morpheus II Vega Edition and keep the card cool and the clock speeds high. I love that you were able to keep the stock backplate. That makes this mod about 10x cooler. As much as I love my bang for buck performance, I also love my eye-pleasing Vega backplate. Would the Radeon VII with 4 HBM hotspots be ok with this card or a new verseion needed?